The Lamborghini Urus is an SUV from Lamborghini, less of the charging-off-road variety like their LM002 and more of the sporty-but-not-a-sportscar type like the Porsche Cayenne or Bentley Bentayga. It initially seemed like a bizarre “we’re obligated to make things that aren’t sportscars” sort of deal, like the Aston Martin Cygnet... until SUVs massively took off as the popular car of choice for the late 10's, making it fit right at home, just in time. Where many Lamborghinis pull their names from breeds of fighting bulls, the Urus is instead an ancient, extinct ancestor of modern cattle, which survived up until 1627. Large horns like the fighting bulls, but more readily domesticated; a fine fit for a car with the styling ferocity and heritage of massive power, but meant more for calmer everyday life. Huge intakes. Carbon fiber splitter. Adaptive rear spoiler. There’s no denying that this still is a Lamborghini in power and style, even if it’s very much a far cry from the sleek supercars that featured in many a poster on many a bedroom wall. It’s very much derided as very un-Lamborghini, even though, like the Porsche SUVs before it, it’s taking their styling to a new market. 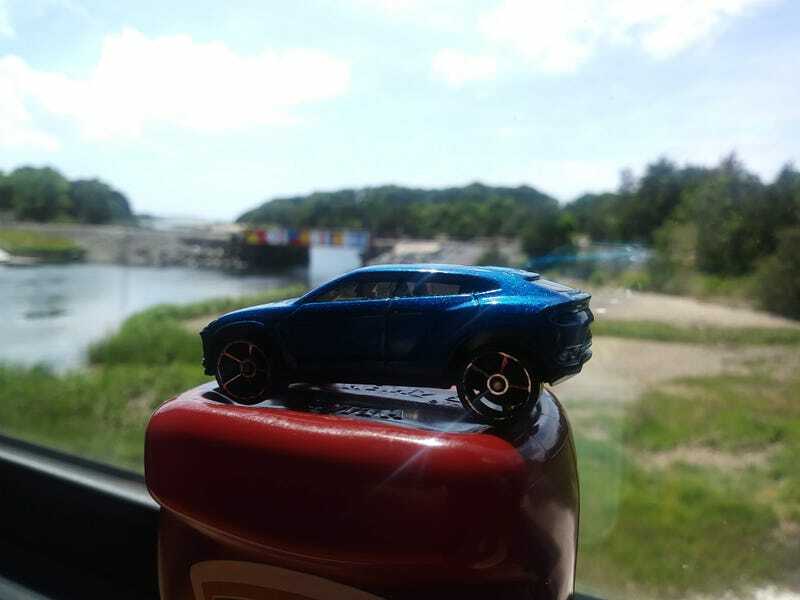 And speaking of design and style, it’s worth noting that the 2014 Hot Wheels Lamborghini Urus isn’t the design that ended up released to consumers in 2018; it’s the 2012 concept model from the Beijing Auto Show. I personally much prefer the original concept to the result; the finished one feels a bit more bulky and jaggedy, to me. Like, it’s got too much going on. Definitely a real photo taken outsi- oh, wait, I already showed you it’s on a ketchup bottle in the window. Never mind. I’d say I’m very glad to have taken it out of the package, though it does worry me that the rims have already chipped. The paint has stayed, the decals have stuck, but if you know somebody that plays a bit rough, this probably won’t come out the other side of a track day looking quite as good as it started. At least the sleeker concept design means it won’t also be vaguely stabby in the process. And thus, with a post composed purely out of spite, so closes the Running of the Bulls, at least for me. Lamborghini’s got a long and storied history, and luckily, a lot of that has translated into some pretty awesome toys and models. I know I’ve got more around here somewhere, so this isn’t the end of my rambling on the subject, but this has definitely been a fun opportunity to showcase some stuff.